Remember when you used to log into Facebook and browse your friends’ walls and leave a funny post on your own wall and then go on about your day? Ahh the good ol’ days! Yes, of course you can still do that, but there are so many more distractions – Friend A just unlocked a new level in Candy Crush Saga, Friend B and Friend C like Subway, Friend D just listened to Ho Hey on Spotify… you get the point. And, on top of that – all of the ads! I have been wedding planning and am currently researching flowers that will go with the theme and color scheme of the wedding. My brain is on overload – hydrangeas, lisianthus, roses, cornflowers, OH MY! So, I took a break and logged into Facebook only to find – ARGH! 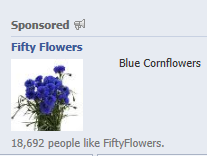 – an ad from one of the websites I had just been on featuring cornflowers! How did they know!? and triggered an ad to show up on the right hand side of my news feed. You may not notice that an ad is actually retargeted unless you’re paying close attention. The retargeted ads will not only show up on the right hand side but are now showing up within the news feed. Okay, this isn’t necessarily a bad thing. Retargeting, also sometimes referred to as remarketing, is a great way to keep your brand top of mind within an already interested audience. 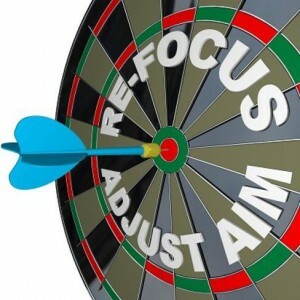 In many cases, retargeting can be one of the most effective ways to obtain conversions on your website. Yes, it can be a little strange, to feel like “Big Brother is watching” but, for the most part, it’s harmless. A great way to use Facebook’s retargeting ads would be to offer some sort incentive to entice your audience back to the website to make a purchase. A coupon discount or free shipping – now you’re talking! Next time you’re browsing Facebook, take a look at the ads – can you spy any ads that may be retargeted? What is the messaging? Are they doing a good job?